I will start out by saying that I am not a nutritionist, doctor, or health care professional. My experience with AltRed is strictly based on my personal opinion and experience as a middle of the pack runner. Please take this supplement at your own risk and if you have any concerns, please consult a physician. 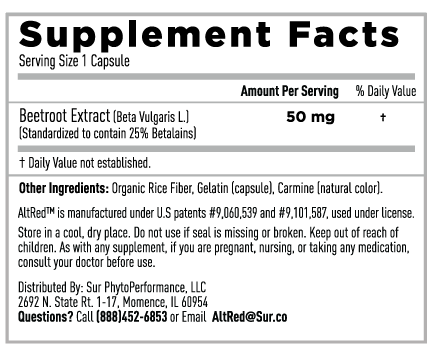 AltRed is a supplement that contains Beetroot Extract, but is produced/extracted using different techniques than other brands of beet juice or beet juice powder that you will find out there. Sur is a small company, founded by Jeff Van Drunen. His family has been discovering, researching, and developing ingredients sourced from nature to improve health for decades. Coming from a family of farmers (7 generations of farmers to be exact) it has always been a passion of Jeff’s family to share natural products with the community. Jeff has been farming since the early 80’s and later on started researching phytonutrients, or natural chemicals found in plants. As an avid hiker and cyclist, he wanted to find natural supplements that would help him recover stronger and perform better. The fact that Sur achieves the highest level of clean certifications meaning that you can use it knowing that you are not using bad chemicals. The NFS Certified for Sport ™ certification ensures that AltRed meets the NSF’s stringent independent certification process guidelines for supplements intended for use by athletes. That means that there are no undeclared ingredients and everything is manufactured according to what AltRed claims. (For more info, visit www.nsf.org). The Informed-Choice certification also checks for banned substances and undergoes rigorous testing to provide assurance that they are safer for athletes to use (For more info, visit www.informed-choice.org). So where do I begin… I have been taking beet juice powder for the past year and can say that while I understood the benefits, I never really felt a huge difference in my endurance or recovery. I would add it to my smoothies, and still do. A few months back I started testing AltRed. I honestly wasn’t expecting much, but the reviews and claims were promising. What exactly is in AltRed? 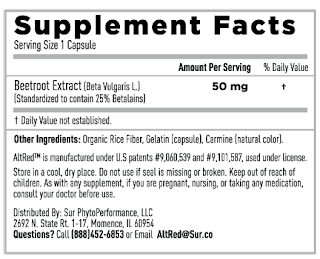 The single active ingredient is a phytonutrient called betalain, which comes from beets. The bright red color and benefits of beets, including the ability to reduce inflammation that comes from exercise, comes from betalains. 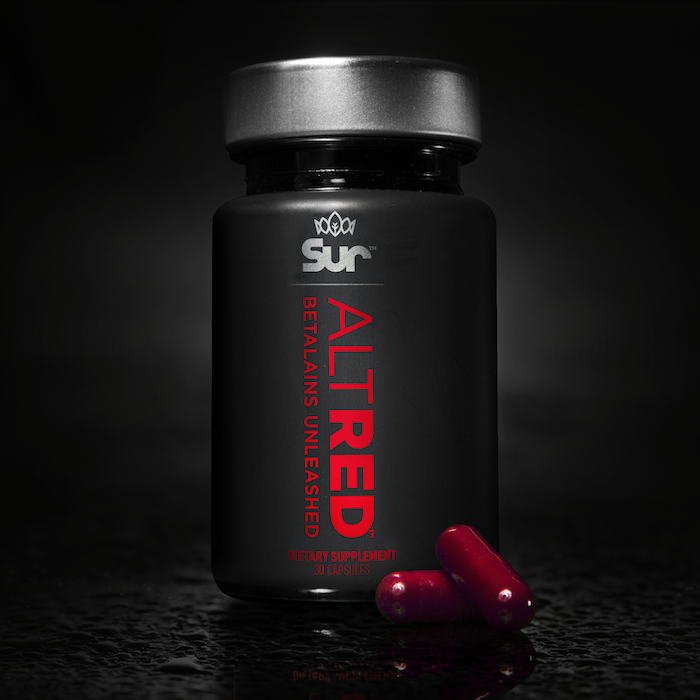 AltRed is produced through a patented process, which isolates and concentrates the betalains, “unleashing” its ability to improve your athletic performance. There are two clinical studies on the AltRed website. The first study was done in my backyard (not literally, but is about 25 minutes away from me). It was at UD Davis, where a double-blind study, crossover study on distance runners was performed. It showed that runners performed an average of 42 seconds faster (3% faster) in a 5k time trial when they used AltRed (click here for the study). The second study, also from UD Davis, focused on recovery. It was a double-blind, crossover study that was conducted on triathletes. 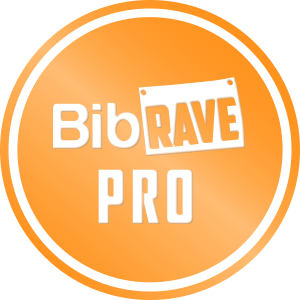 It showed that the athletes performed an average of 45 seconds better (3% faster) in a 5k “recovery” time trial performed twenty-four hours after completing a 10k time trial when they used AltRed. They also completed the initial 10k time trial 54 seconds faster when taking AltRed (click here for the study). Other impacts on endurance and recovery when taking AltRed may include producing more power, increasing efficiency, reduction in muscle damage during activity, and stronger recovery (including a reduction in lactic acid). There are quite a few claims there. So how did my testing go and did I see or feel some of these things? First of all, the directions say to take one capsule, 2 hours before you start an activity. For activities lasting more than 2 hours, you take another pill every 2 hours including at the start of your activity. So what exactly did I experience? I had been training hard for quite a while, going from one training block to the next with little downtime. 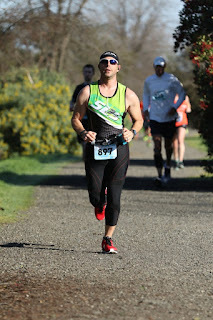 I had the California International Marathon in December and only had a few weeks off before I started training for Way Too Cool 50k. My mileage was fairly steady. When I started to take AltRed, I was running at about a 65-70% Max Heart Rate (HR), which was around an 11:00-12:00 pace. I started to notice a difference after only a few days. I felt more energy and could perform better day after day (better recovery). My 65-70% Max HR was now dropping to about a 10:00-10:30 pace, which was quite a change. I did not change anything else in my training, so I was really surprised by the results. 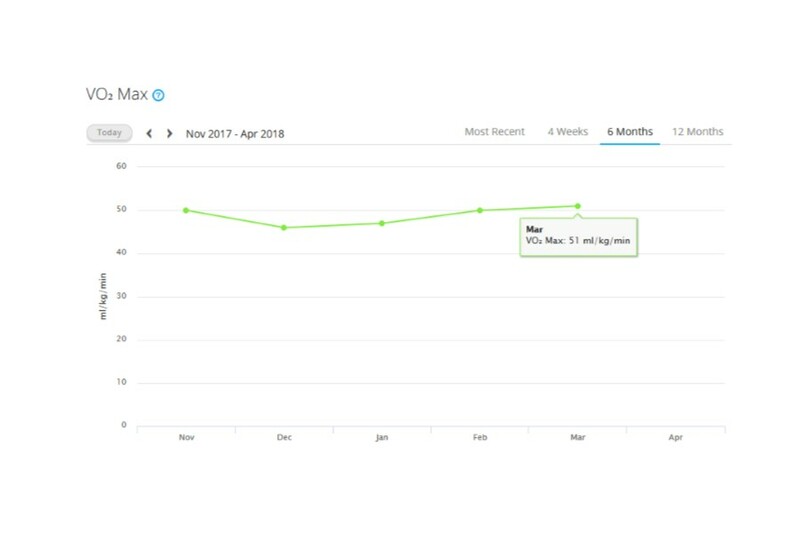 I also watched my VO2 Max (The amount of oxygen my body is able to burn) go from 47 in January to 50 in February, to 51 in March. This is all with being about 10 pounds over my ideal race weight. I have not had numbers like this since I was at my peak as a runner (lowest weight, very lean, and injury-free). This reading was taken off of my Garmin Forerunner 935, so I know it is not a true reading of my VO2 Max, but it does shoe an increasing in my overall endurance and energy output. As I said earlier, I was a skeptic going into my testing of AltRed. I can’t tell you how many product I have tried that make big promises and most of them fall short. I am not discounting other products by any means, which is why I still take beet juice powder. I do have to say that these are results that I experienced and I have read that not everybody will experience supplements the same way, so my results may be different than what you encounter. I loved AltRed so much that I became a Brand Ambassador, also known as a #phytorebel. It basically means that I am committed to train with plant based supplements and am an advocate for clean sport. It is a great product that I enthusiastically endorse because I have seen the results. So let’s look at the details. AltRed comes in a bottle of 30 capsules. The capsules are small and easy to swallow. The retail price is $50 per bottle, but if you are interested in testing it out, please feel free to use my coupon code (company approved). It will help me out and save you money. Just use the code “BGOLDMAN-ALTRED” at checkout and you will get 15% off each and every bottle (if you click any of the links on this post, it should automatically apply the discount). Please feel free to share this code with your friends or on social media. Every individual will see and feel different results when they take supplements, mainly because each of our bodies have differences (level of fitness, diet, genetics, etc.). For every story or review you read saying a product is awesome, there is probably one saying the opposite. My personal experience with AltRed changed me from being a skeptic to being a believer. I am not promoting AltRed for any other reason than I feel that it is an amazing product that may help you in your fitness endeavors. 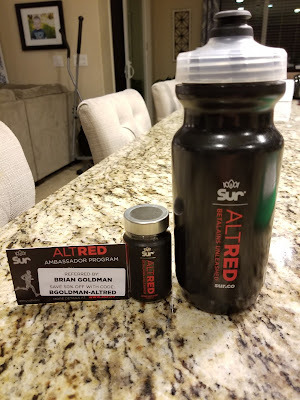 Please give it a try if it sparks your curiosity, but be sure to use the discount code “BGOLDMAN-ALTRED” at checkout to get 15% off your order. There is no reason to pay full price. I would love for you to share your experience in the comments below, no matter if it is good or bad.